Domino’s Pizza ran a campaign that lowered the price of a Pepperoni Passion pizza with a starting value of £15.99 each time Twitter users posted with the hashtag #letsdolunch. 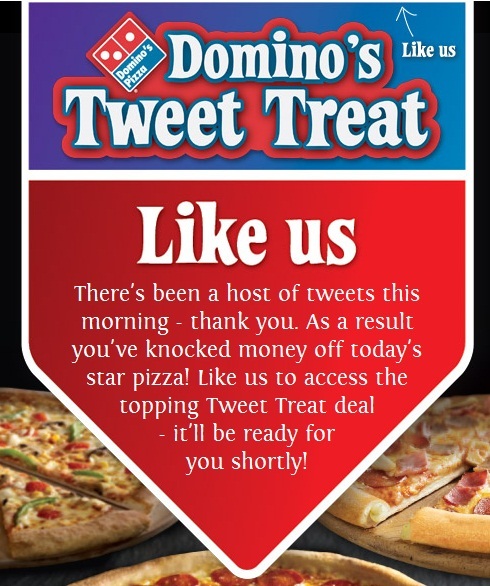 The 'Tweets For Treats’ campaign ran from 9am to 11am today (5th March), allowing followers to buy the cheaper pizza between midday and 3pm, with each tweet shaving 0.01p off the price. The falling price of the pizza was displayed in real-time on Dominos' Facebook page here, though the price wouldn't drop below £6.59, according to the terms. Given that Monday lunchtime is hardly likely to be prime pizza ordering time, I doubt a loss-leader like this will hit Domino's too hard financially, but it gained some nice online love and their Facebook 'likes' increase by 4,000 within the morning. I do like that the campaign isn't ashamed of the fact it's being run to earn Domino's money – all too often, social media campaigns are all about the 'engagement'. 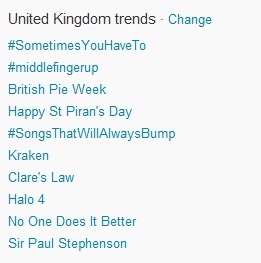 However, I am a bit unsure about the number of tweets the campaign claims to have encouraged. Calculations: the final pizza price was £7.74. As each tweet shaved 0.01p from the price, 825 x 100 (tweets per 1p) = 82,500 tweets with the hashtag #letsdolunch. A tweet that includes the hashtag #letsdolunch will result in a minimum of 0.01p being knocked off the price point of the large Pepperoni Passion. However, please be aware that Domino’s reserves the right to change the value being knocked off the price point at any point during the time period of 9am and11am on Monday 05 March 2012 but at no point will it drop below 0.01p. I guess they increased the amount knocked of with each tweet by quite a bit.